Training on use of climate information for supporting mung bean and cacao production in Indonesia, 2014. Capacity building of actors working with adaptation planning on the ground is not an easy business, especially when you are working in a context of small islands states, each with varying landscape types and climates. SEI Research Associate Takeshi Takama knows how to creatively improvise when needed. But how do you make sure actors embed their new knowledge in their everyday work? SEI Oxford and SEI Asia have been managing a Sida programme support project in South East Asia focused on strengthening climate adaptation planning for small island communities through customised learning techniques. It has combined face-to-face and testing of offline and online learning opportunities that are responsive to the specific needs of the participant group and allowing the participants to pass their training on to others. A specific goal was to explore approaches for continued learning following the training. The long-term aim is to build capacity and expertise in climate adaptation planning at the sub-national level through collaboration with local partners, in this case: the Santiri Foundation, Mataram, Lombok, Salonga Center of Law and Development, Dilliman University, Dumaguete City and Indonesian Meteorological, Climatological and Geophysical Agency (BMKG). Through existing training experience within SEI Oxford and Asia, a training needs assessment and collaboration with the local partners, the project developed an approach that is interactive and very hands-on in nature, where participants (from NGOs, Universities, government units and agencies) and worked on their case studies to apply the new information, tools and methods being shared. This means that information and knowledge generated during the training is contextualized and adapted to fit the realities of the participants. SEI Asia has been instrumental in the training, managing logistics and providing trainers with necessary language capacity and translation. The method also builds capacity among the trainers, increasing their ability to produce demand-based training materials. Learning modules were developed prior to training in Lombok, Indonesia and Dumaguete, the Philippines for a broad participant group and delivered in November 2013 in the weeks following typhoon Yolanda/Haiyan. A subsequent survey of all participants identified gaps in knowledge such as: “training in formulating climate change action plans, examples of projects addressing climate change which link to policy development, local climate analysis, and vulnerability analysis.” Further case study modules were developed to respond to these gaps and further training opportunities identified. You can find them here. How is this training hands-on and what were the outputs? 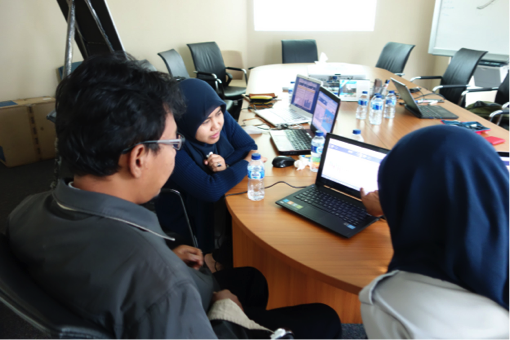 SEI Research Associate, Takeshi Takama, was involved in the initial training sessions, which identified a need for subsequent customised training for the government body BMKG (Indonesian Meteorological, Climatological and Geophysical Agency). This was completed in in December 2014. So what kind of capacity building was involved in this training specifically for government climatologists? SEI asked Takama: “I knew they needed more training on how to interpret data and graphs about climate change into the information for their clients - as BMKG is aiming to be an institute not only collecting data, but also providing analysis on climate change.” Takama tailored the sessions using the weADAPT climate change adaptation knowledge platform and CIP (the Climate Information Portal managed by Climate Systems Analysis Group at the University of Cape Town). The format of the training is central: “The technical knowledge and skills amongst BMKG staff vary; therefore I always suggest to have tutorial style training for selected several staff instead of a lecture for a few dozen people.” Takama explains. The main part of training involved how to narrow down assessment areas, search relevant data and information in weADAPT and CIP, analyse and interpret semi-raw meteorological data into useful information for the target sectors identified by participants: cacao production in Gorontaro, Sulawesi island and mung bean production in Sumbawa. In the training participants followed the weADAPTstep-by-step guidance to use climate information, which Takama explains is do-able for a 2 days training session and easy to comprehend for participants with different levels of understanding around climatic change. He would recommend it as it does not require an external educator or a lot of preparation. Using case examples turned out to be a useful approach, since it gives a more hands-on feel to it and increases the interest of participants when they get to explore and apply climatic data to places and challenges which are familiar to them. What are the best methods for an impactful training session? 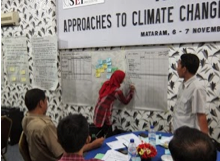 As outputs, the participants registered themselves and their institute on weADAPT and produced two draft reports on climate change and climate risks to production of agricultural products, which are now publicly available in weADAPT (Sumbawa bean case, Gorontalo cacao case). There were some learning points regarding the climatic data in the CIP; which showed slightly different results from data hold by BMKG. However, in general the feedback from the staff was positive. “The participants told me that they have not had this kind of training before, so they appreciated it.” Takama says. However, it is more difficult to assess the long-term results. “It will take some time to see outcomes from the training, but I think they better understand uncertainty and modelling issues in climate change and how to read graphs. These skills will be useful for their daily operation as analytical skills are what they need to upgrade BMKG’s tasks.” A follow up-survey confirmed that the participants understand charts and graphics relating to historic and future scenarios of climate now than before and can apply them and describe them in a report. They have continued to use the weADAPT modules to access climate data and review the training they received. They believe this skill set needs further enhancement especially since, as government officials, they need to provide certain services to users of BMKGs climate data, such as scientific reports and other communication material. Learning from this experience could make way for future opportunities, for example to address requests from training participants such as linking tools within an overall framework of climate adaptation planning processesin the small island regions. Further support of local adaptation networks in island communities across a range of livelihoods/sectors could continue by building on the modules and worked-through cases developed by staff and participants, thereby building up a bank of material for future training programmes. SEI’s ability to further improve its delivery of webinars and online learning could be advanced based on this experience. This project has also made way for updating of historic and projected climate data for South-East Asia available currently on weADAPT. This could happen through collaboration between BMKG, SEI and CSAG, University of Cape Town, and in terms of capacity and outreach to communities in the region would be of particular value. The value of SEI staff’s ongoing relationship with the BMKG, Salonga Centre and Santiri foundation is a major benefit to SEI’s future cooperation and capacity building collaboration in Indonesia and the Philippines.